It’s been a busy month as my wife, Cheryl, and I relocated from the mid-Hudson Valley region of New York to the far west Texas city of El Paso. We arrived July 3rd with a couple of cars, a couple of dogs and some belongings. There was no time to visit El Paso to house hunt before our move, so we rented our new home on the recommendation of Cheryl’s UTEP co-worker. We have settled right in and spent time coordinating legal papers and exploring our new city and region. It was odd for those first couple of weeks as the moving van did not arrive until July 16. This offered plenty of time to decide where furniture would be placed and what rooms would be earmarked for other uses, such as the hobby room. Here’s how the hobby room looked shortly after we arrived. And here is a view from the opposite corner. These images were taken with my iPhone and poor lighting. And to nip the most likely model railroad question in the bud early, no there is no basement in this home. None. As any model railroader will do with an empty space at hand, I began contemplating a new railroad. The basic room dimensions are 9-foot 10-inches across the wall with the window, and 14-feet down the wall opposite the entry. The closet can provide additional space, as it is just over 2-feet deep. 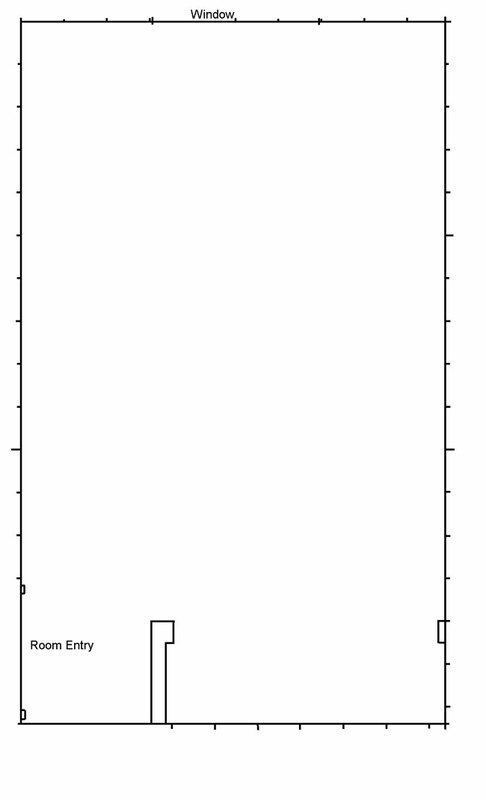 Here’s a scale outline of the space I created using Photoshop Elements. Click on the image for a larger version. I did not devote my usual time to sketch and doodle as my usual box of drafting tools was packed away on the moving van. But a couple of prototype locations had been knocking on my brain for awhile and it seems this room could accommodate one of those ideas. Before I could draw a single line or decide what prototype elements to squeeze into a small area, I had to consider larger questions. A big question is, how long will we be living in this home? I’ve moved three times since the spring of 2009, so this is an important question and it sets the tone to create parameters for the next layout and the hobby room in general. I have details at hand for two fascinating prototype locations that have drawn my interest and may fit into this space. The first spot is an extension of the original layout with the focus on the Wheeling & Lake Erie mainline through the metro-Cleveland industrial neighborhood of Newburgh, Ohio. 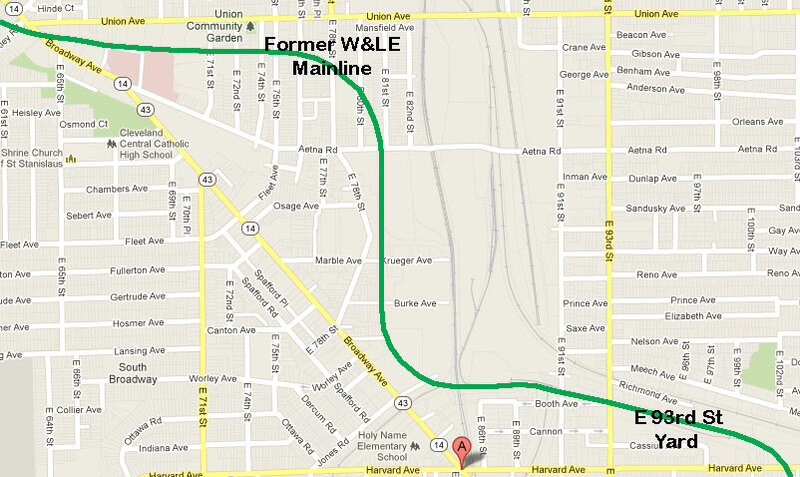 Here’s a Google Earth image with the former W&LE mainline traced out. Click on the image for a larger version. The modeled portion would include the East 93rd Street yard and extend west to the crossing of Broadway Avenue, and serve a variety of mid-sized industries. The yard would act as an active staging and fiddle yard. Local switchers would work west, while a couple of yard crews could switch the immediate businesses. One or two industries just east of the yard would be moved closer to increase and balance operational opportunities. Interchanges with the Pennsylvania Railroad and the Newburgh & South Shore increase the action and freight car diversity. Curves would be tight, but the original railroad was a narrow gauge and had tight clearances through this part of the city. The layout benchwork would be kept narrow, 12-15 inches deep, around the room perimeter, with the east and west ends located on a 30-inch wide peninsula coming out from the closet. The other prototype location caught my interest back in 2000 when I purchased a copy of a railroad Valuation map at the Library of Congress Archives II facility. I was searching for a different map at that time, but I was struck at the sheer amount of activity documented on a map that covered one mile of the Baltimore & Ohio Railroad just south of the Wheeling, W. Va. passenger terminal. My attention kept focusing on a pocket-sized freight terminal shoe-horned into an odd plot of land next to the downtown business district. Click on the image for a larger version. I plan to keep a late 1926 modeling era, no matter which prototype is chosen. This pre-Depression era means the freight terminal was a busy hub of activity with freight cars spotted in the covered freight house as well as on the team track yard. This may have been switched twice a day, or more. I also suspect this freight terminal may have been a hub for B&O Less-than-Car-Load (LCL) service, as there are five different B&O lines that connect in the Wheeling-Benwood area. Raising the interest level is readily available documentation of the prototype structure. 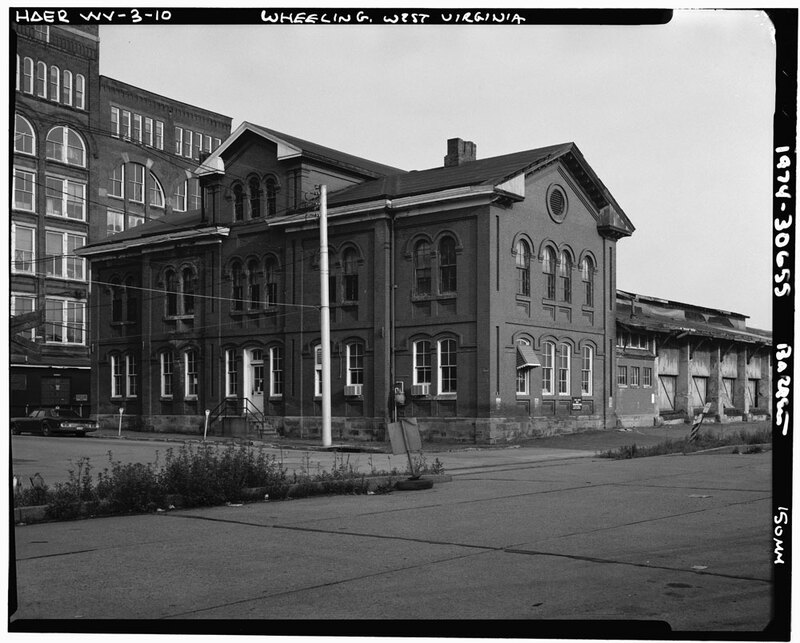 The Historic American Building Survey and Historic American Engineering Record (HABS/HAER) measured and photographed the freight house just before it was razed in the mid-1970s. Here’s an image of the original building. A larger version can be seen once you click on the image. The last layout I built came down a year ago when we moved from the Chagrin Falls, Ohio home. Some of this coverage is here on the blog. Two moves later I am looking at a slightly larger space. As another move may occur within two years, this new project needs to be easy to move. The last layout was not easy to move, even though it was not very large. I was also spoiled in New York over the last year with opportunities to operate on a few different model railroads each month. These experiences are pushing me towards a sectional layout construction that can be set up with a minimum of effort. Basic, same-sized benchwork components (such as 2×4 foot) will be built for the railroad to be fit onto. It would be easy to fill the room with an intricate layout, but that can take time to build. To satisfy a need to operate, I would like to get this layout up and running quickly. If we move in a year or two, then disassembling the basic components should be easy and enable quick reuse in a new home. The ever popular mantra of Keep It Simple Stupid is looming over this next project. I could compile more choices of course, but I have enough detail on both of these locations to move forward. It would be interesting modeling a portion of my new home city of El Paso, but I have nothing at hand to inspire those efforts. Plus, I have enough stuff on hand to build the Wheeling line through Newburgh, or the B&O Wheeling freight terminal. I have much to do before the sawdust flies as the garage needs to be organized better to fit a car and create a workspace. I’m progressing a bit each day with the garage so a solid hobby room plan is needed soon to keep this moving forward. If you would like to voice your opinion to sway my decision, please follow the directions of the anti-spam program when you leave a comment below. Comments are reviewed and approved before they appear here. I look forward to hearing your suggestions. My “vote” would be to continue along the W&LE East 93rd Street path. Having more space to “explore” the industries west of the N&SS/PRR/W&LE interlocking would be a LOT of fun to operate. The industries in that area show that they built to fit into the pre-existing railroad’s footprint. Curved buildings and inset (angled) loading docks show the history of the area. Good luck with your new home and your new modelling ideas. Moving is stressful. Previous Previous post: Another guest post! Next Next post: How does it all fit?